Full name: Julius Max Schulze. He was the Hindenburg's bartender, and had been part of the Zeppelin family since the beginning of 1936. He was born June 4, 1877 in Weissenfels, Thüringen. In October of 1935, he married Marie-Anne Eugenie Alexandrine Wisniewski, in Hamburg. 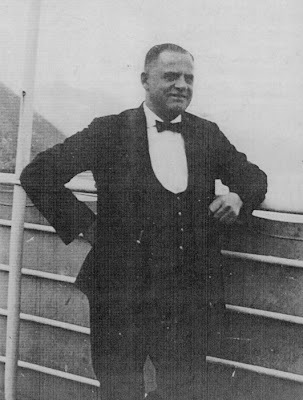 Schulze had been a steward and bartender for the Hamburg-America steamship line for about 25 years, and eventually wished to get in a few years flying on passenger Zeppelins to cap off his career as a steward. He had written the Zeppelin Company a number of times during the early 1930s, asking whether they needed a bar steward, but until the Hindenburg was built the only ship the Zeppelin Company had was the Graf Zeppelin, and there was no bar onboard. 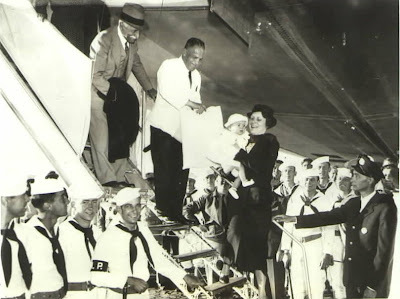 When the Hindenburg went into service in 1936, however, it was equipped with a state-of-the-art bar and smoking room, and on March 10, 1936, Max Schulze was hired to man it. 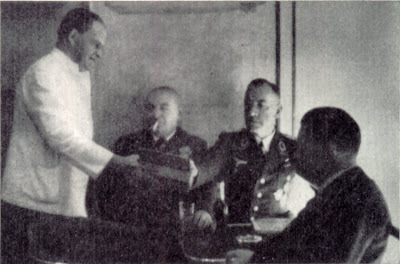 Engineer Hermann Pfaff of the LZ-127 Graf Zeppelin (left). 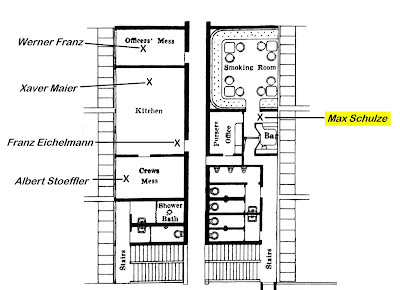 As the steward in charge of the Hindenburg's bar and smoking room, it was Max Schulze's job to not only serve drinks, but also to man the pressurized door leading from the bar to the starboard hallway on B-deck. It would have been quite easy for a passenger with a few drinks in them to accidentally walk out of the smoking area carrying a lit cigarette, and Schulze had to keep an eye open to make sure that this didn't happen. Schulze apparently had some trouble with some of the American cocktail recipes during the 1936 season (the DZR's end-of-the-year report for 1936 mentions specifically that American passengers were surprised to learn that Schulze had never heard of a Manhattan), but the amiable "Max the Bartender" was quite popular with both the passengers and the crew. He was still manning the bar at the beginning of the 1937 season, as the Hindenburg made her first North American flight of the season during the first week of May. 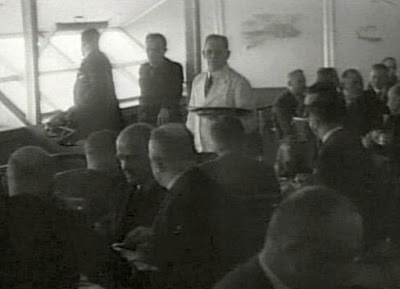 Max Schulze (upper center, white jacket) assists the dining room staff in waiting tables during a particularly crowded flight in late summer or early autumn, 1936. As the Hindenburg came in to land at Lakehurst on the evening of May 6th, Schulze was in the bar cleaning up, having served his last customers a short while before. Chief Steward Heinrich Kubis was probably the last person to see him alive, as Kubis quickly checked the smoking room for any stray passengers before going upstairs to prepare for landing. It's not certain exactly what happened to Max Schulze when the Hindenburg suddenly caught fire 15 or 20 minutes later. He was apparently in either the bar or the adjacent smoking room at the time. He may perhaps have been injured by bottles falling from above the bar as the ship tilted aft, or since the bar was on the starboard side of the ship he may have (like a number of passengers on that side of the passenger decks) been either caught in collapsing wreckage or else overcome by the fire and smoke that was being blown by the wind towards the starboard side of the ship. In any case, he didn't make it out of the wreck alive. 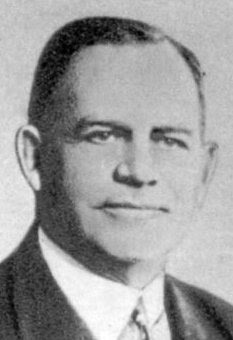 On his death certificate, dated May 10, 1937, Ocean County coroner Raymond Taylor listed Schulze's cause of death as "Zeppelin explosion, severe burns". Max Schulze's body was shipped back to Germany along with the bodies of a number of his crew mates. 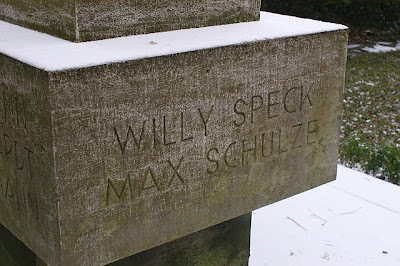 He was buried in a common grave at Frankfurter Hauptfriedhof cemetery alongside Chief Radio Officer Willy Speck, Captain Ernst Lehmann, radio operator Franz Eichelmann, electrician Ernst Schlapp, cook Fritz Flackus, and Helmsman Alfred Bernhardt. Absolutely top-notch and totally fascinating. I'm about 99% positive that nobody's ever compiled bio info on all of the people who were onboard the Hindenburg's last flight. Should have been done 40 or 50 years ago when people were still alive and relatively young and could have passed on a lot more info and anecdotes. But, I'll do what I can now. Great job Patrick.Nice that Max Schulze will be remembered & not just a post script on the bottom of a page. All thanks to your hard work & dedication. Thanks, Les. I'm glad to be able to contribute in some small way to Herr Schulze and the others being remembered. Couldn't have done Schulze's bio nearly as well without your help, though. Thanks again for sharing all those photos and documents with me. Added new information and photos to the article on Leonhard and Gertrud Adelt. Added new photos to the article on Christian Nielsen. Added new information and photos to the article on Severin Klein. Posted a significant expansion/update to the article on Wilhelm Balla. Added more new information to the article on George Grant. Added information to the article on George Grant. Added updated information to the article on Werner Franz, who passed away on August 13, 2014. Added new photo and additional information to the article on Nelson Morris. 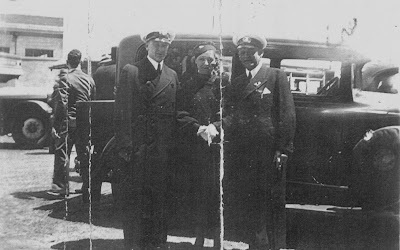 Added post-crash photo of Captain Ernst Lehmann to his article. Added updated and expanded information to the article on Rolf von Heidenstam. A freelance writer/editor from Chicago, IL, I have been a student of airship history for over 30 years. In addition to providing historical consultation to a number of documentary productions on the Hindenburg, as well as to the Smithsonian National Postal Museum's "Fire and Ice" exhibit, I have also recently begun a new blog entitled Projekt LZ 129 in which I will post articles on a variety of Hindenburg-related topics that go beyond the scope of the passenger and crew biographies that I've included here. Copyright Notice: All text on this website is copyrighted by Patrick B. Russell and may not be reproduced in any way without the express written consent of the author.